The name of Charles de Gaulle is known throughout the world as one of France’s leading statesmen. He was born in Lille in November 1890, but grew up in Paris where his father was a teacher. An imposing figure, at 6 foot 5 inches, De Gaulle chose a military career and served in World War One with distinction. He was wounded twice and taken prisoner by the Germans, yet survived to be married in 1921 and later had three children. During World War Two he was one of the few French generals who refused to accept the surrender of France. He escaped to London, in June 1940, and announced the formation of a French government in exile, becoming the leader of the ‘Free French’. After Paris was liberated in August 1944, de Gaulle was given a hero’s welcome in the French capital, driving down the Champs Elysee alongside Allied officials and in front of the liberating troops. Upon his return, he moved back into his old office at the War Ministry and served as the head of a provisional government from September 1944 to January 1946, when he resigned, complaining of insoluble conflict between the political parties. In 1958 there was a revolt in French-held Algeria together with serious unrest in France itself as political in-fighting became worse. De Gaulle was asked to come out of retirement as the only politician whom all factions saw as able to solve the Algerian crisis and return France to normality. Fifty years ago this month, Charles de Gaulle was appointed as Premier. He requested emergency powers for six months, as he said the country was in a state of siege. The National Assembly met his request, and in elections held in November 1958 de Gaulle and his supporters won a comfortable Parliamentary majority. At the end of the six months, General de Gaulle was elected President of the Republic. De Gaulle has been honoured on the stamps of many countries. These range from issues that mark achievements in his own life through to inclusion in issues devoted to ‘World Leaders’ or similar group names. 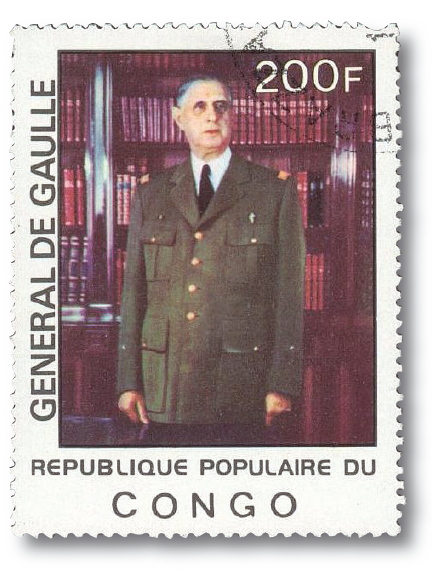 During his ten-year term as President, de Gaulle made state visits to many lands, prompting more philatelic celebrations by the host nations. 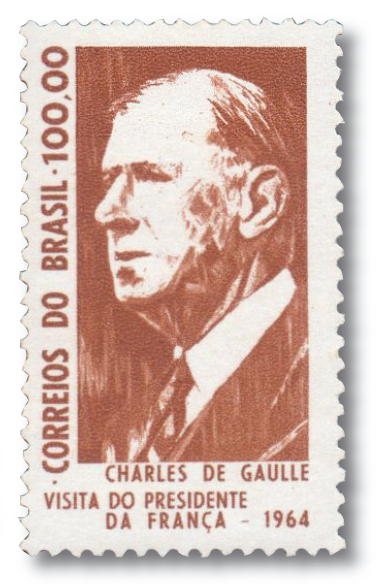 The example illustrated here, showing a drawing of his head and shoulders, was produced by Brazil when de Gaulle visited that country in 1964. A similar portrait design, but using a colour photograph instead of a drawing, came from Yemen. This was one of a set of 11 issued by the Royalist Kingdom in 1969 entitled ‘Famous Men of History’. Listed in the Appendix in the Stanley Gibbons catalogue, these so-called stamps were produced for the philatelic market only and never saw postal use. 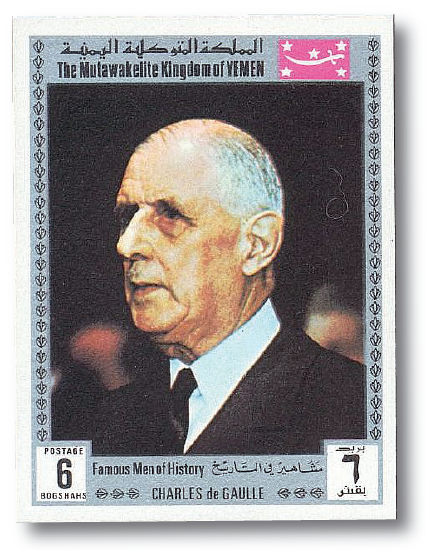 Mali produced a stamp in 1995 in a ‘Personalities’ set that showed de Gaulle’s portrait based upon a painting. Also included in this design was a vignette showing de Gaulle attending a victory ceremony. The final illustration comes from Congo and is taken from their 1977 set issued for the Silver Jubilee of Queen Elizabeth II. Two of this set of four showed pictures of the Queen, but of the other two values one showed de Gaulle and the other King Baudouin of Belgium. The connection between these foreign celebrities and our Queen is unclear and suggests that the set was simply targeted at thematic stamp collectors. 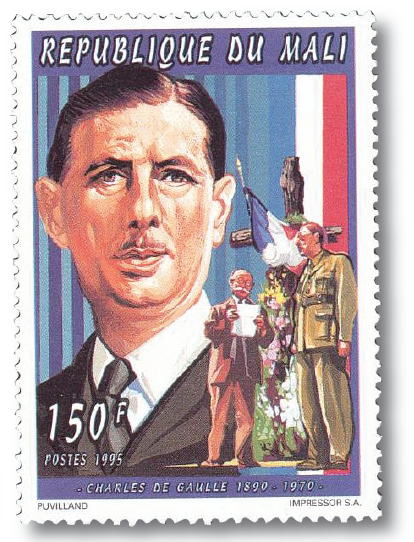 France honoured de Gaulle philatelically on issues produced in 1971, 1977, 1988, 1990 and 1995. Wallis & Futuna (1971, 1973, 1980 and 1990). Visit our growing archive of stamp guides and read more thematics articles.